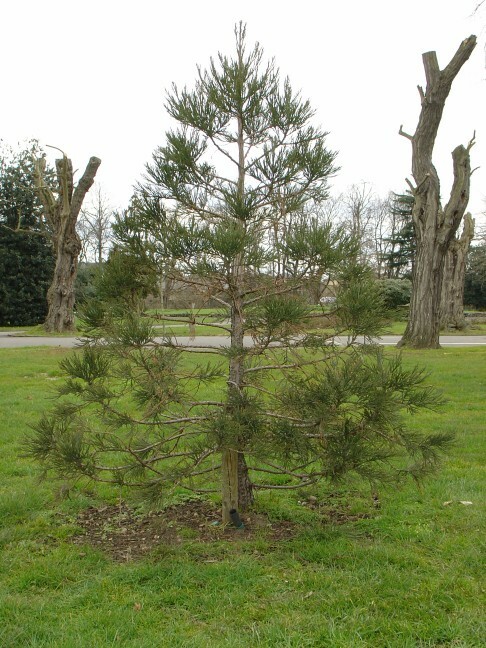 This very young specimen was planted in January 2002 by Barking Council to create a future focal point in Barking Park. It looks a little sparse at the moment and is surrounded by a few dead tree stumps, but Giant redwoods are real survivors, so hopefully this one will in time thrive and mature into a wonderful landmark visible for miles. 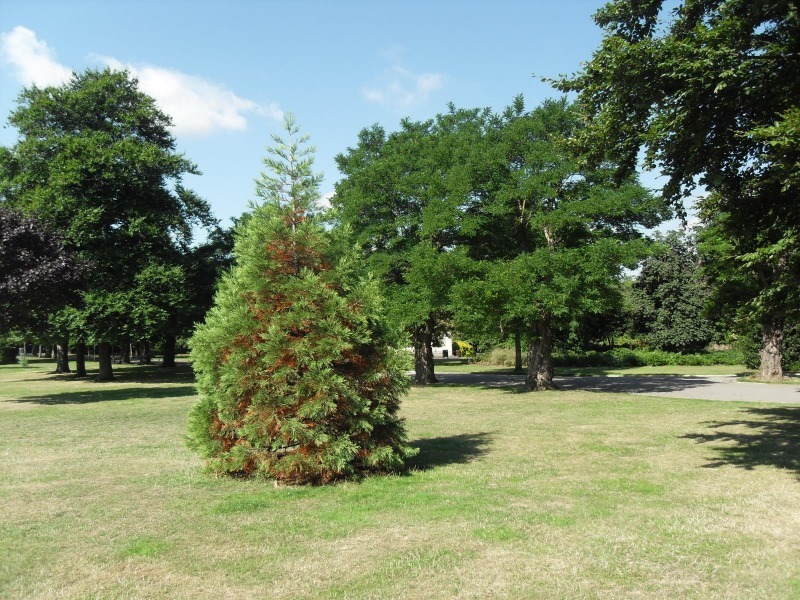 Well done to Barking Council for an excellent choice of specimen tree. On a brief visit in 2010 it was good to see this young tree in good health, having put on weight in foliage. I have noticed that young trees often suffer a bit of a setback for several years when they are first planted. This should give encouragement to anyone who is concerned about their young Giant Redwood saplings. By the way, the "dead tree stumps" in the background were obviously still very much alive after their drastic haircuts in 2005! Terry sent the above photograph of the Giant Redwood in 2013. Although it has suffered a little in the dry summer, it is still growing well. Terry said, "I live near Barking Park in Essex. I noticed your web site on the redwood in Barking Park, so I went and located it. For a couple of years I have taken an annual picture of the tree. I have a interest in the redwood trees because my son live in California and I have visited the redwood forests. 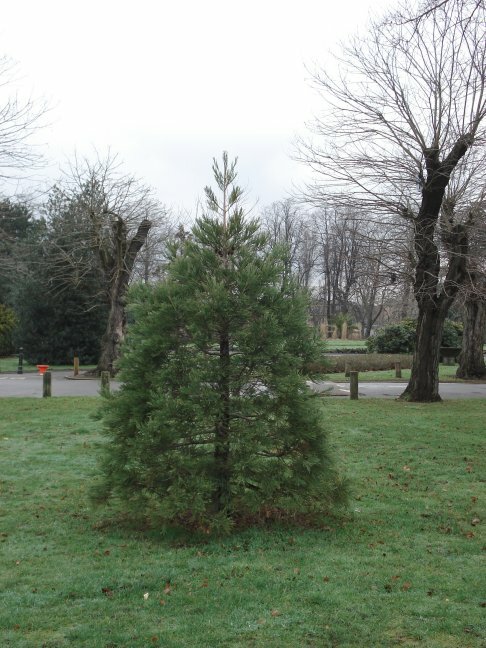 I have a question, is there only one redwood in Barking Park, because I think their are two, may be I am wrong. Can you help?" 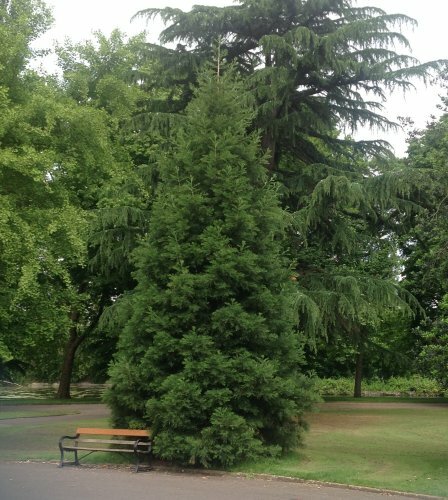 Terry's photograph shows that there is no mistaking this is another young Giant Redwood in Barking Park that I hadn't spotted. Thanks Terry! A visit to measure this one, and to re-measure the first, is on my ever-increasing list of things to do. Thanks to Terry for sending approximate measurements of the two trees, calculated with the thumb and fist method he learnt on YouTube. 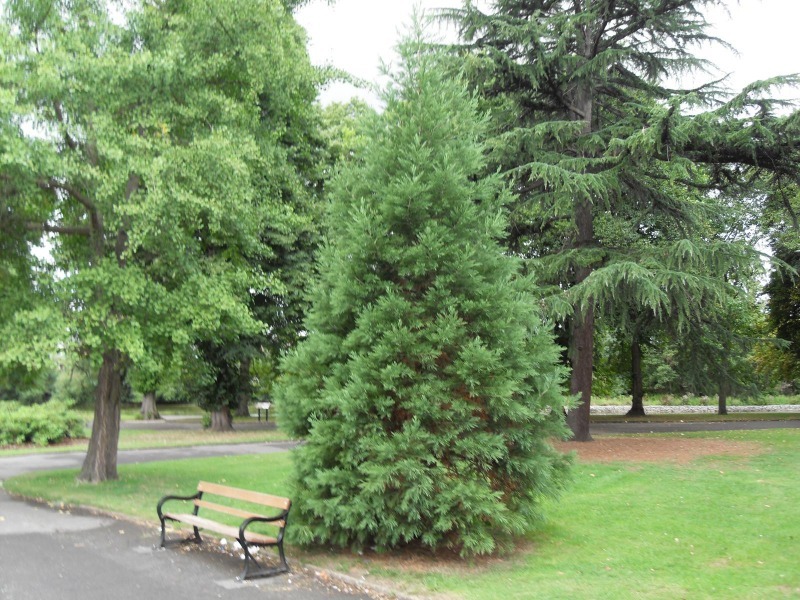 "The first recorded tree measures 4.8 metres high and the second tree (with chair in front) measures 6.7 metres high. 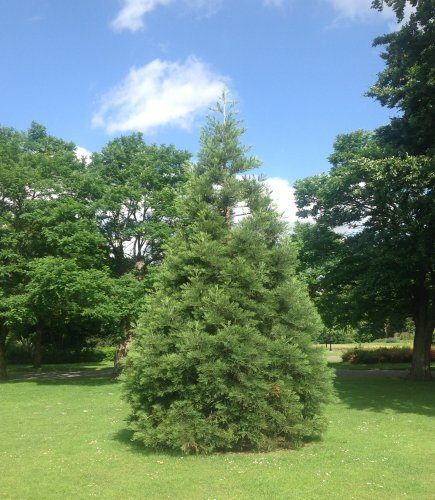 Both trees look fine and are gaining height." Terry sent another update on the two Giant Redwood in Barking Park. Terry says "The two trees are growing well and starting to look majestic. Measured by the fist and thumb method both trees have grown. Tree1 Height is 5.8 metres. Tree2 (with chair in front) Height is. 7.5 metres." Thanks Terry, they really are coming on well and taking on that typically conical shape of a youngish Giant Redwood. Looking back at the earliest picture of one of the trees, it's great to see how it has gone from looking very sparse and not particularly well, to looking incredibly lush.